Red Emmerson, the 90-year-old chairman and CEO Emeritus of Sierra Pacific Industries, will be honored during the upcoming Timber Processing & Energy Expo as Timber Processing magazine’s 2019 Person of the Year. Since the last issue of Timber Processing, when we indicated we would present the award during the Portland, Ore. show to somebody, but didn’t name the person, we’ve received numerous e-mails inquiring as to whom it would be. Now you know. Archie Aldis “Red” Emmerson himself will be on hand at 4 p.m. on Thursday, October 18 at the Hatton-Brown Publishers Media Presentation Center at the front of the floor in Hall E of the Portland Exposition Center. This will be a quick presentation with a short reception to follow, and really anybody on the show floor at the time can walk over to the Hatton-Brown booth and take it in. Mr. Emmerson will be the 31st recipient of the award, which first went to another Northwest sawmiller, Duane Vaagen of Vaagen Brothers Lumber, in 1989. We’re hoping that some of the previous persons of the year might be able to stop by the booth and allow us to recognize them to the gathering. Needless to say we’re long overdue (would negligent be a better word?) in presenting the award to Mr. Emmerson. 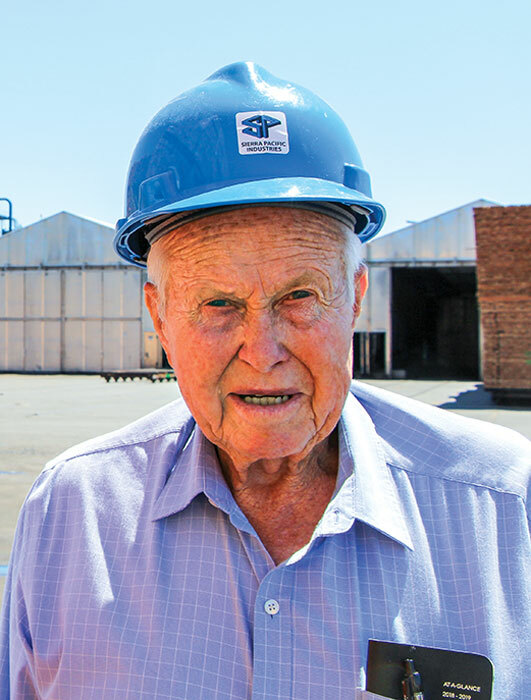 It’s almost unfathomable, starting really from scratch, what he has accomplished—partnering early on with his dad—with Sierra Pacific Industries since the post-war years. Today the company operates 14 sawmills in California and Washington, producing in the range of 2.6 billion BF annually. These are high-tech sawmills, as evidenced by our cover story in this issue on SPI’s new sawmill at Shelton, Wash. The company owns 1.95 million acres of timberland in those states, making it reportedly the third largest landowner in the U.S. behind John Malone and Ted Turner. Some of the stories about Mr. Emmerson’s purchase of some of those timberlands are absolutely remarkable. Perhaps most impressive of all is the philanthropy undertaken by the Sierra Pacific Foundation toward community projects, youth activities and student scholarships especially in areas where the company has operations. Red Emmerson remains a sawmiller through and through, and his sons and family members are as well. Our January issue of Timber Processing always features the Person of the Year and we hope to be able to sit down with Mr. Emmerson between now and then and get him to reflect on his outstanding lumber career.